The steel anti-theft roll container provides protection against unauthorised access to the contents. 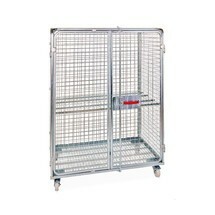 It has close-meshed, galvanised panels and is equipped with a mechanism for a padlock. This robust and durable steel roll container enables you to speed up order picking and transport tasks. 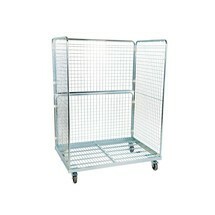 The 3-sided mesh design protects the goods being transported and holds them securely in place. 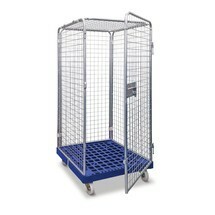 The enclosed, lockable and closely meshed anti-theft roll container with a 500 kg load capacity offers protection against unauthorised access to the contents. Shelves are also available as accessories.